The tires on the new Raptor also feature a special design. 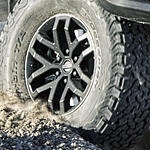 The BF Goodrich All-Terrain KO2 tires help to grip rough terrain, such as gravel roads along desert highways. The sports car engine in this truck gets up to 450 horsepower. In addition, the FOX Racing Shox suspension system makes it effortless to maneuver on rough terrain. It's time to get into a new truck. Have you seen the latest Raptor? You can test drive this sporty pickup truck at Performance Ford Lincoln Bountiful.